I’ve recieved tons & tons of requests for new “Uncle D Pre Recorded CB Chatter Mods” for SCS products and I need you drivers to understand it takes months & months to collect usable content and hours of sound editing to get you guys just one decent file so that’s the reason for the delay. Today I release 47 mins of new content for you drivers to enjoy! This one midway had me cracking up and if you know how truckers like to talk smack on CB’s get ready for this one! As always with my CB chatter mods, WARNING ADULT LANGUAGE!!! these files are not intended for younger SCS drivers or sentive listeners. 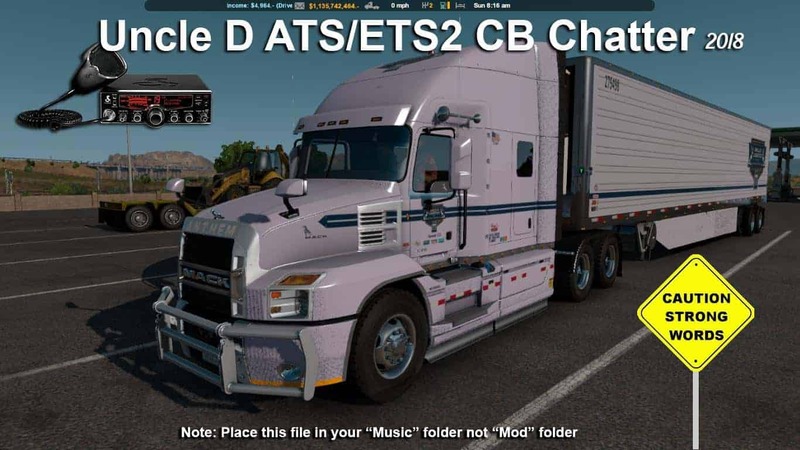 This mod is simply a studio edited MP3 file you will place in your SCS “MUSIC” folder not “MOD” folder and play with your in cab radio playlist ok. Other than that enjoy drivers and keep on trucking!